Never set off fireworks before? Not sure if you’re lighting them safely? Fireworks are fun to watch, but they can also be very dangerous when you’re setting them off. Don’t worry! 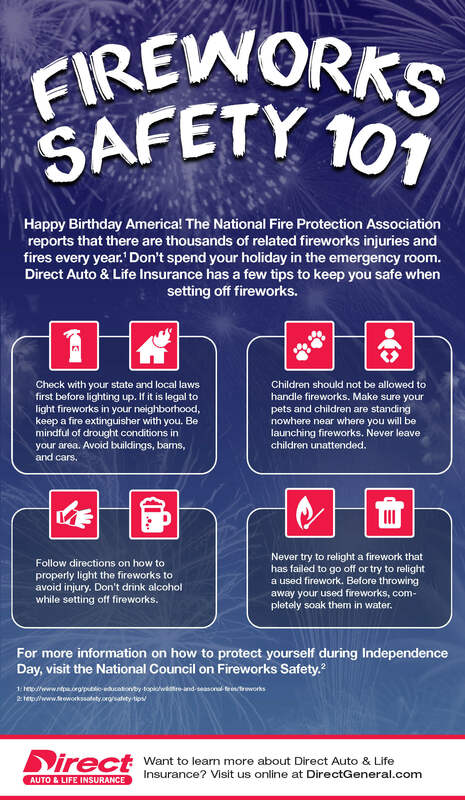 Direct Auto & Life wants to make sure you celebrate safely. Check out our easy to follow safety tips below! Happy Birthday, America! The National Fire Protection Association reports that there are thousands of related fireworks injuries and fires every year. Don’t spend your holiday in the emergency room. Direct Auto & Life Insurance has a few tips to keep you safe when setting off fireworks. Check with your state and local laws first before lighting up. If it is legal to light fireworks in your neighborhood, keep a fire extinguisher with you. Be mindful of drought conditions in your area. Avoid buildings, barns, and cars. Children should not be allowed to handle fireworks. Make sure your pets and children are standing nowhere near where you will be launching fireworks. Never leave children unattended. Follow directions on how to properly light the fireworks to avoid injury. Don’t drink alcohol while setting off fireworks. Never try to relight a firework that has failed to go off or try to relight a used firework. Before throwing away your used fireworks, completely soak them in water. For more information on how to protect yourself during Independence Day, visit the National Council on Fireworks Safety.